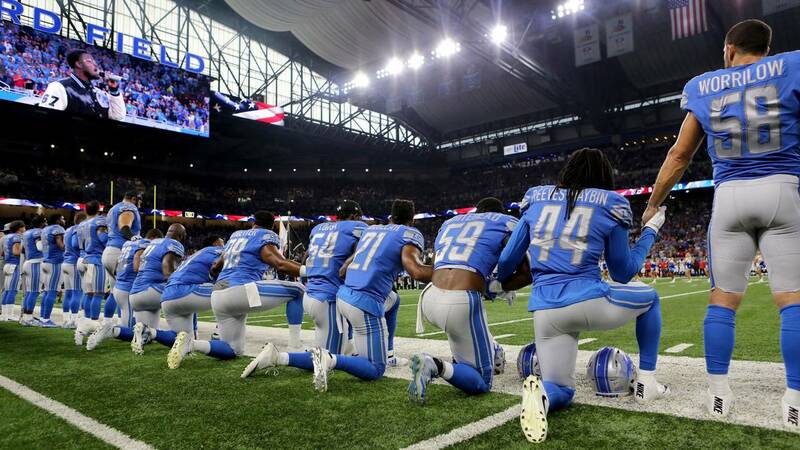 Detroit Lions players kneel during the national anthem during the 2017 NFL season. (CNN) - The NFL is to shelve its new policy regarding conduct surrounding the national anthem until it reaches an agreement with the NFL Players Association. The decision -- issued in a joint statement by the NFL and the NFLPA -- comes just two days after Tennessee Titans star Jurrell Casey told CNN he would protest on the sideline during the national anthem and pay whatever fine necessary. "Around the NFL, guys are definitely not happy about it," said Casey about the policy which stated that players must either "stand and show respect for the flag and the anthem" or remain out of public view in the locker room. "I feel it's not right, I don't think it was a good decision for the NFL to come up with that ruling. But they have their reasons for what they've done." "I'm going to take a fine this year, why not?" added Casey, the first NFL player to express his desire to protest despite the rules. "I'm going to protest during the flag." The anthem controversy has been rumbling on since 2016, when then-San Francisco 49ers quarterback Colin Kaepernick kneeled during the anthem to draw attention to racial injustice. The row ratcheted up a notch in 2017 when U.S. President Donald Trump said players' kneeling showed "total disrespect for our great country." The unhappiness of Casey, who is an eight-year veteran, seemed to echo that of the NFLPA which filed a grievance against the league on July 10, stating that the policy infringes on players' rights. "The union's claim is that this new policy, imposed by the NFL's governing body without consultation with the NFLPA, is inconsistent with the collective bargaining agreement,' said the NFLPA statement. After withstanding two seasons of backlash against players kneeling, raising fists and displaying other means of protest during the anthem, the NFL said it would fine teams with protesting players directly, who in turn would have it in their discretion to enforce pre-game anthem observations in their own ways. The wording caused confusion among teams, players and fans. Reacting to Casey's comments, Titans CEO Steve Underwood indicated he would not fine Casey for raising a fist after the anthem, as the player did last season, telling The Tennessean "there may be some misunderstanding on his part." Now the NFL has decided to take its new policy back to the drawing board, and won't punish visible sideline protests for at least "several weeks." "No new rules relating to the anthem will be issued or enforced for the next several weeks while these confidential discussions are ongoing," the statement added. The NFL regular season starts on Thursday, Sept. 6.